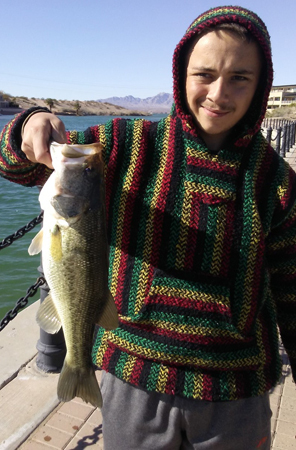 Lake Havasu has a healthy population of catfish, especially channel cats. They can be found all over the lake and are almost always caught using bait. Catfish can be caught all times of the day, but fishing is usually more productive if done at night. Use your heavier gear because catfish aren’t as line shy as other species. For bait I would suggest using anchovies but, nightcrawlers, chicken livers, mackerel, and stink bait also work well. If you’re fishing with anchovies make sure you chum a little as if you were striper fishing. I usually use as big of chunk of bait as possible… the bigger the bait, the bigger the bite. If you are strictly targeting flatheads try using live bluegill for bait. Using a heavier set-up for catfish always make sense. There are some pretty big flatheads swimming around down there. A heavy action rod with 15-20 lb line should do the trick. Catfish take some time to eat the bait. Lots of fish are lost when you feel the initial bite and try to set hook, usually ripping the bait out of the fish’s mouth. To avoid this use a reel with a clicker or leave you bail open. Let the fish take off a few wraps of line before trying to set the hook. Catfish usually aren’t that hard to locate. Find drop-off’s into deeper holes and they will usually be holding fish. In late summer and fall they will be in the shallows, don’t be afraid to fish too shallow.